Is that the Earthquake in India ? On the 24th of January I started a Natural Radio measurement in the frequency range below 80 Hz. The station I used is a coil with 1000 turns in a special amplifier. These amplifier using the AD621 is specialy created for the range from 0 to 5 kHz. The output of the amplifier is conected by isolated wire to the soundcard (64V PCI) of my computer. The software to show the spectrogram is the wellknown Gramm V 5.1. In the afternoon hours I observed a week, but readable signal starting round 14 Hz and running within 18 Minutes to 1 Hz (This line is marked with the letter "A" in the picture). When I showed the other pictures from the night I saw some more lines between 1 and 14 Hz with a amplitude of nearly 3 hours, ending on the 25th in the forenoon hours. I could not explain sutch a line, and I did not found anything in the literature I have about natural radio. Just a few hours before I heard about the 7.9 eathquake in the India/Pacistan boarder area and I remembered the lines I found on the natural radio spectrograms. 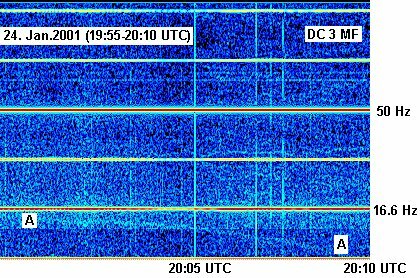 Could it be possible, that the variating lines with an amplitude of nearly 3 hours are the start of an earthquake, about some 7000 km from my station? I have no idea if that is possible. It is well know that in the time fronting earthquakes several efects in the ULF range could be observed. And one of these is a electromagnetic wave between 0.6 and 10 Hz, observed several times in the San Andreas line and too in the Kamchatka Area (former Soviet Union, now G.U.S). If a reader of these page has an idea send me a mail with your opinion about the measurement.